From left to right: David Rowe, managing director; Robyn Lockhart, account’s assistant and Claire Frost, Alzheimer’s Society. 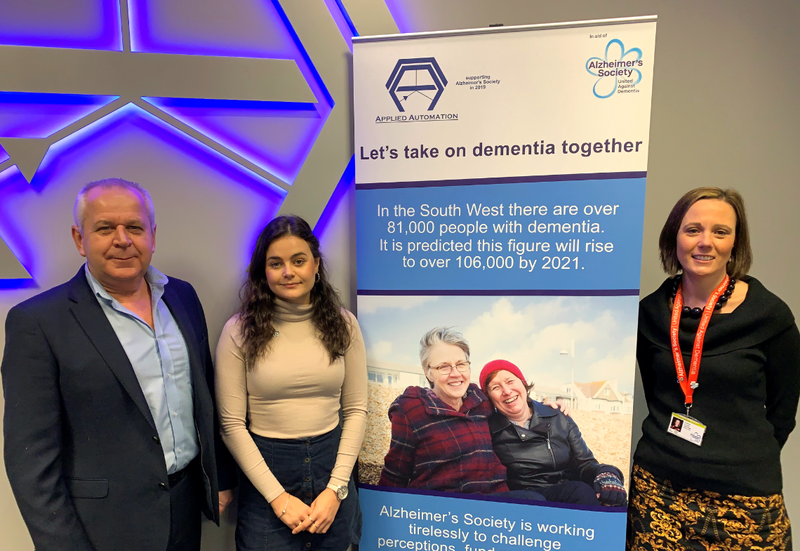 Plymouth engineering firm, Applied Automation (UK) Ltd will be supporting Alzheimer’s Society throughout 2019. It is hoped that staff will donate or get involved in various fundraising activities to help support a charity that helps fund research and supports people living with dementia. Dementia is the UK’s biggest killer. Someone develops it every three minutes and there’s currently no cure. If a member of a family has dementia it can have devastating consequences. The gradual, but all too swift, decline in being able to carry out every day activities can be heart breaking for those affected and their family and friends. To learn more about the work of Alzheimer’s Society or to offer support, visit alzheimers.org.uk.